Ford Mustang and Ford F-Series are officially the "Hottest Car and Truck" at the 2013 Specialty Equipment Market Association show. The SEMA Award – presented today – recognizes the most popular vehicles SEMA members feature in their displays at the organization's weeklong trade show in Las Vegas. Before this year's show opened, SEMA officials walked the floor of the giant aftermarket expo and counted the number of new 2013 and 2014 cars and trucks exhibited in booths. More Ford Mustangs and F-Series are on display than any other car or truck – testament to the popularity and appeal of Ford vehicles. "Ford was the first automaker to share detailed vehicle specs with SEMA members," said John Felice, Ford vice president, U.S. marketing, sales and service. "Thirty years later, we're proud that more aftermarket accessories and parts are created for Ford vehicles than for any other automaker." The specialty parts market has grown to a $31 billion industry, which translates into more than 1 million U.S. jobs, according to SEMA. Ford's 27,000-square-foot indoor exhibit is home to 57 customized vehicles, including "Vandemonium" – 10 Ford Transit Connect Wagons and cargo vans treated as blank canvas by aftermarket tuners to illustrate the vehicle's use beyond family or commercial transportation. Aftermarket modifications include eye-catching paint and new fascia, but the customization goes much deeper. The builders incorporated a functionality into the vehicles that captures the spirit of Transit Connect, including creating a mobile boutique, a working bike shop and a portable two-person gaming lounge. Ford's exhibit also includes Snakebit, a custom 1956 F-100 pickup, presented by KISS bassist Gene Simmons and his wife Shannon Tweed. 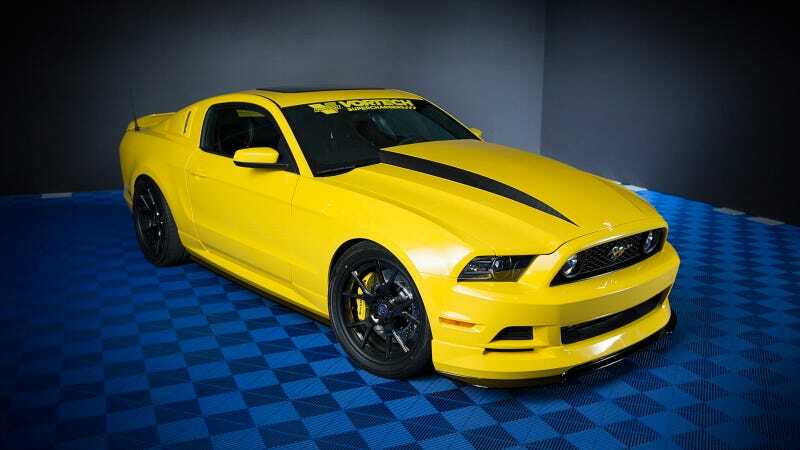 Snakebit features Ford's supercharged 5.4-liter V8 engine and styling cues that pay homage to classic Shelby Mustangs. The truck will be auctioned off next year for charity. Ford offers race fans at SEMA the opportunity to be among the first to play Xbox One's "Forza Motorsport 5," which goes on sale Nov. 22. Enthusiasts can take the new 2014 Ford Fiesta ST for a virtual spin at the exclusive Xbox One demo stations on the show floor, including the custom-designed Fiesta ST MRT Xbox show car. At the 110,000-square-foot "Ford Out Front" display outside Las Vegas Convention Center, attendees will see how Ford takes customers further on the road, off the road and at the track. Media will have the chance to ride in RallyCross Fiestas driven by Ken Block and Tanner Foust. Fans can also get in on the action, with ride sessions offered for the Fiesta ST and F-150 SVT Raptor used at Ford-sponsored racing schools.